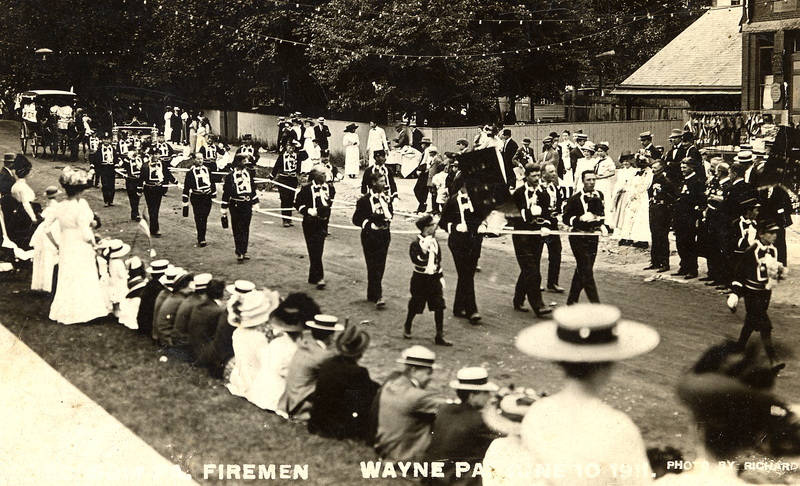 A firemen's parade in Wayne c.1915, look at the ladies styles!! NOTE: While doing research on another article I came across this article on changing woman's fashion from one hundred years ago. I do not understand most of it but found it funny and interesting. There you are. There’s no getting away from it, these trig, practical, comfortable garments are here to stay apparently till the crack o’ doom. So, let’s see what new ideas the shops are offering us this season for wear during spring and summer months. Perhaps there is just one thing a woman won’t do to be in fashion, and that is break her neck (though, indeed, some of them have almost hobbled away to join the angels), so that on account of this fussy notion of hers, the newest skirts are considerably wider about the bottom. They are by no means voluminous, however, 2 ¼ to 2 12 yards being the favored width. They must above all be cut on straight lines and allow the wearer to present the narrow silhouette that is the keynote of the present styles. Into some of the skirts are cleverly introduced a couple of small pleats in the back or front panels or in the side gores which give added freedom of movement without in any way affecting the style of the garment. Many of the skirts are trimmed with wide folds of the same material put on four or five inches from the bottom, and some models show a revival of the high waistband, with the waistline about two inches above the normal.. For later wear the silk skirts will be much worn, but just now the worsteds, serge, voiles, and panamas in black and blue, particularly, are in demand. Quite a few knobby styles are shown in grey mixtures, and the hairline stripes are also returning to favor. The veiled effects that were so universally employed for the winter blouse have been carried over for the spring, with only slight modifications in materials and styles. Lighter weight fabrics, of course, are desirable for the foundations of these dressy little blouses and silk mull, net and china silk, with chiffons, marquisettes, net, or any of the transparent materials for veiling them, make up most attractively. They are often very simple in design, the only ornamental touch being in the lace collar and, perhaps tiny undersleeves. One charming model intended to be worn with a blue tailored suit was made in the popular and becoming style with sleeve and blouse in one. Over the foundation of white china silk was laid a flowered chiffon with a white ground over which were scattered tiny nosegays in soft shades of blue and green and rose color. Over this again was chiffon matching the blue of the suit, which was also used to form narrow pleated frills, about the white lace collar and at the elbow above the narrow, lace under sleeve. In the more elaborate blouses are seen rover effects and many sailor collar developments carried out in colored chiffons contrasting with the waist material. The lingerie waists are filmy with lace – two, three, as many as five kinds of lace are sometimes used on a single model. Lawn, batiste, marquisette, and voile are the favored fabrics. The comfortable and youthful Dutch neck will be much seen this summer, while the peasant sleeve, in three-quarter length takes precedence over all others. Pleatings give a chic touch to the semi-tailored waists. These are often edged with narrow lace and outline the front or side opening of the waist. One waist had a frill of real lace that not only outlined the front closing, but followed the yoke outline on the left side from the shoulder to the middle front. The tailored models show no radical changes. They are made usually with pleats down the front and back, and sometimes with broad pleats over the shoulders. Invariably they have long sleeves with the straight, stiff cuffs, though now and then one sees a soft, turn back cuff on some of the embroidered waist. Hand embroidering is in very good style. It may be most elaborate and carry but a variety of designs on the collar, cuffs and front pleat, or it may be a single scalloped finish for the side or front fastening. CPP's Biggest Party of the Year! Our event features fine catering provided by Kings Mills, including hors d'oeuvres, dinner, dessert, wine and beer. This year, our event will also feature the exquisite music of Celtic Harpist Pamela Dimeler, a member of the Brandywine Harp Orchestra. Tickets are $70.00 for members, and $75.00 for non-members. You are welcome to come in colonial costume, but you'll have just as good a time in your cocktail attire! Your support is essential to our success--we'll see you there! We are thrilled to have Pamela Dimeler, a member of the Brandywine Harp Orchestra, as our guest musician for the evening. Pamela is owner and Director of the of Parkside Academy of Music and Dance, which she opened in 1986. She also teaches piano and ballet. Just a few of our live and silent auction items! Traditional Afternoon Tea for eight guests, presented by Sarah Farnsworth. Served in the venue of your choice (or even Sarah's garden!) tea includes assorted tea sandwiches, Devonshire scones and clotted cream with strawberry jam, assorted English cakes and biscuits, and English style tea. Ric Miller, owner of RCI contractors, will provide 6 hours of labor within 30 miles of the Colonial Plantation. Ric will meet with the winner at no charge to schedule the work. Winner provides materials for the project. Bid on a quilt hand-pieced and machine quilted in a Bordered Nine-Patch pattern using all cotton materials. This exquisite quilt measures approximately 68"x78" and will make a lovely addition to any home for generations to come. This panorama captures the Eagles' first Super Bowl victory in franchise history, defeating the New England Patriots at U.S. Bank Stadium in Minneapolis, Minnesota. After a season-ending injury to their starting quarterback, the Eagles were led by backup QB Nick Foles to victory over the defending champions. Our auction features two cross stitches by Eleanor Shanks: "Vintage Home" and "Victorian Home," winner of the Best in Show blue ribbon at the Maryland State Fair. Shown here: "Vintage Home." Can't make it to the event but still want to help? You can make a donation to help our event be a huge success! A monetary donation OR a donation of an item, a basket, or an experience would be wonderful and would be a great way to help us reach our goal. If you'd like to make a monetary donation toward our event, it's easy -- just CLICK HERE to go to our Paypal page. If you have an item or experience you'd like to donate, please email us at Fundraiser@colonialplantation.org.